For use on refractors of F/4 to F/9, the user needn't worry about configurations. Just insert in your diagonal, add an eyepiece and view. 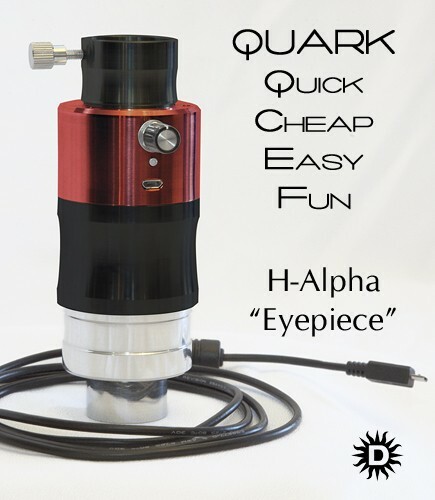 The QUARK contains a custom Daystar Instruments 4.2X telecentric barlow lens fully optimized in coatings and optical design specifically for the Hydrogen Alpha wavelength. This highly specialized telecentric lens offers superior field flatness. 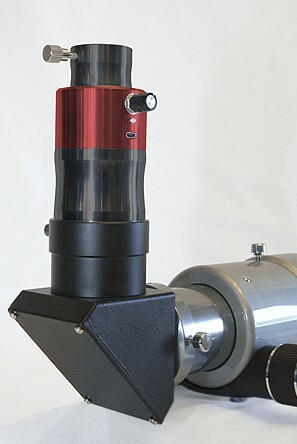 Exact filter bandpass will vary based on final telescope application, so QUARK assemblies are qualified to show either prominence or surface (chromosphere). No specific FWHM bandpass is designated. Now observers can buy a filter based on their desired observing goals instead of their budget. Choose prominences and surface (Chromosphere) detail. Both are available for the same low price! The fully optimized design eliminates the need for any adapters. It's all combined in one lightweight eyepiece sized device. The new, compact design configuration eliminates unnecessary components, weight and associated costs. We even reduced power consumption, so the Quark can now operate all day off a small, palm-sized optional battery pack. Baffles have been added to increase contrast and AR coatings are optimized for the 656nm wavelength. 1.25" or 2.0" combo eyepiece snouts with safety indent slot directly into your diagonal Standard 1.25 eyepiece drawtube output with optional 2" and SCT accessories available. Tuning knob allows wing shifting +/- 0.5Å with detents at every 0.1Å LED indicator for power, warming, ready, fault 5 year warranty. Full disk viewing possible on refractors up to ~450mm focal length refractors No aperture limitations. May be used on larger refractors for higher magnification views Ships in convenient Twist-Case for safe, dust-free storage.